Prevent wood destroying fungi from damaging the structure. Reduce or prevent the amount of molds and mildew present in the structure. One is for the structure and the other is more of a health concern, both however require the same fundamental steps for control. Wood decay fungi (primarily brown rot including the water conducting fungi and white rot) cause as much, if not more damage to structures than termites each year. Estimated residential repair cost for 1960 were $7.6 billion and for the year 2000, they were projected to be more than $17 billion. 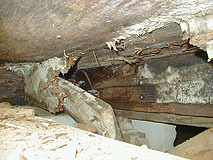 Often, damages attributed to termites are actually primarily caused by wood-decay fungi because favorable moisture conditions were not corrected. The presence of non-decay fungi (primarily surface-staining fungi or molds and mildews. And sap-staining fungi) is a good indication that conditions exist which may soon be favorable for wood-decay fungi. These fungi are found throughout the United States, Although some are restricted to areas of warmer and/or more humid conditions. Recognition of the individual types of fungus and or mold/mildew is the first step in the proper control. The identification must be done by qualified moisture/fungus control specialist trained in this area. Control measures differ for the control of different types of fungi. As well as the type of structure and its location. All wood-decay fungi require the proper mix of food (wood), moisture (dampness) temperature (mild), and air/oxygen for growth. Food – Cellulose and lignin of plant cell walls. The “eating” of the wood is what produces the damage. The surface molds/mildews (non-decay fungi) feed on the stored starches, sugars, proteins, and/or fats as food. This may cause some discoloration but little effect on the wood. Moisture – Wood needs to be near fiber saturation point to sustain wood-decay fungi. For most U.S. species this is 28-32%. Below the fiber saturation point, the fungus is inactive, but not dead, and growth will resume when the required conditions are again met. Temperature – Fungi are inactive at cool temps. Most attain optimum growth rates between 70-85 degrees. Air – Decay requires as little as 1/20 of the oxygen found in the air, so it is rarely a factor. Fungi can easily enter a structure as air borne spores, or from ground contact. It may also come in from infested lumber. As the name describes these fungi do not destroy wood, and are many times referred to as molds and mildew. Many individuals are suseptable to the spores produced from them. Symptoms have ranged from simple irritation of the nose,( the sniffles) to very severe. Each person will react differently to the different types and severity of the molds present. Individuals with breathing difficulties such as asthma may have more problems with molds. Today’s homes can be a breeding ground for mold and mildews. 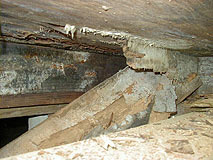 These fungi do not require the levels of moisture needed for the wood destroying types. Most molds can live off the ambient moisture found in most homes, particarly in the southern, warmer climates. Crawl spaces are the best breeding grounds for all these fungi’s. Correct any leaks as soon as possible and take steps to prevent serious water problems. Shut off washing machine hose valve when you leave. Use high quality washing machine hoses like “flood-chek”. Inspect your plumbing and repair as needed. Install pans under water heaters and washing machines. Look for any discoloration of walls and floors. Check in enclosed areas ( closets, behind machines etc.) For molds. Have a/c system serviced regular and be sure the drain line is open to the exterior and away from foundation. The most important thing that can be done is to have the property inspected to see if any visible signs of fungi are present and the property evaluated for corrections if needed. Inspect the property carefully and evaluate the condition of the fungi problem. Determine the source of the moisture/ water contributing to the fungi problem. Ground water, plumbing, condensation, high ambient moisture. Determine the proper course of action. Review the finding with the homeowner. Implement a program that best applies to the property and occupants. If water is a factor it must be dealt with first. Repairs to plumbing, a/c. one or several may apply. Condensation is by far the biggest problem we encounter. When the hot humid outside air reaches the cool enviroment of the crawl area the water condenses. This forms droplets of water on the surfaces of the wood, insulation, ducts, etc. Until recently technology only gave us a couple of options and all really consisted of more ventilation, fans, additional vents, etc. Now we have an option that really addresses the whole problem. “CleanSpace” is a system that sovles the age old problem of outside high humidity in the summer and the cold drafts of winter.